Demonstrators hold signs in Portland's Monument Square Thursday night. 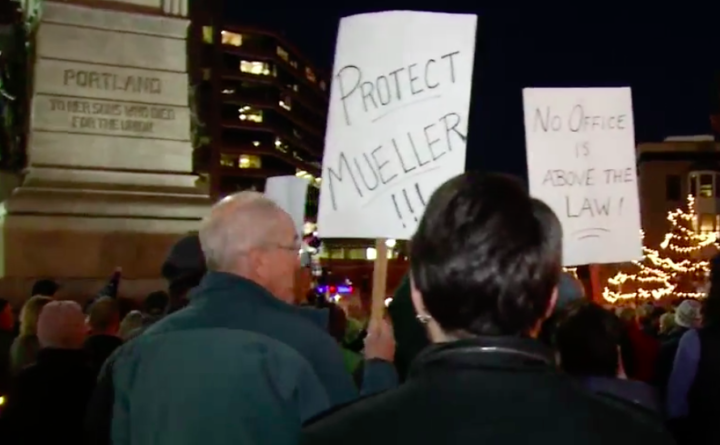 More than 300 people gathered in Portland Thursday night as one of several rallies across Maine to demand Special Counsel Robert Mueller’s investigation into Russian interference in the 2016 election be allowed to continue, according to organizers and multiple media reports. The team led by former FBI director Mueller is probing, in part, whether there was any coordination between the Russian government and the presidential campaign of Donald Trump. The investigation was thrown into doubt when Trump, now president, on Wednesday forced out Attorney General Jeff Sessions, who refused to intervene in Mueller’s inquiry. The Portland demonstration was one of a number of such rallies taking part around the state and country Thursday. The group Suit Up Maine claimed nearly 400 people turned out to demonstrate in Kittery, 200 more in Brunswick, 150 in Bar Harbor, 75 in Damariscotta and 60 in Bangor, as well as nearly 100 in each Belfast, Rockland and Augusta.